With the two main parties in Pakistan's ruling coalition deadlocked over the reinstatement of judges sacked by President Pervez Musharraf, the BBC's Barbara Plett in Islamabad explains the complex political machinations underlying the issue. Everyone in Pakistan agrees that President Pervez Musharraf's dismissal of Supreme and High Court judges under emergency rule last year was unconstitutional. Even he has admitted this. And the country's new, democratically-elected government has vowed to restore the sacked judges. So why is the issue dragging on without resolution? 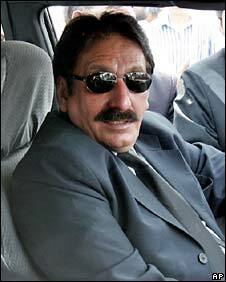 The controversy has focused on the deposed Chief Justice, Iftikhar Mohammed Chaudhry. Mr Chaudhry stepped on a lot of toes while head of the Supreme Court. He held the ruling elite to account. He rattled the security establishment by pursuing the case of the "missing" - alleged terror suspects abducted and held incommunicado by Pakistan's intelligence services. And he took up legal challenges to President Musharraf's re-election. That was his biggest sin in the eyes of Pakistan's military establishment. Last November, the president used emergency rule to get rid of him and other troublesome judges. Mr Chaudhry's critics say he played politics. His supporters say he stood up to interference from a military ruler. For them, his reinstatement has become the symbol of judicial independence. "If we compromised on the chief justice then we wouldn't have a principled stand!" says Tariq Mehmood, a former president of the Supreme Court Bar Association. "How can we digest this? That you restore the rest of the judges and you do not restore the chief justice - and he was the head of the institution. We cannot ignore him!" The case became a live issue in February's elections. Former Prime Minister Nawaz Sharif staked his campaign on a promise to restore the sacked judges, including the chief justice. Now Mr Sharif and his Pakistan Muslim League (PML-N) have to deliver. "It's the word of the PML-N, the credibility of the PML-N, the commitment that they've been fighting for, a free judiciary," says member of parliament Ayaz Amir. Nawaz Sharif did much better at the ballot box than expected. So well, in fact, that the main election winner, Asif Zardari's Pakistan People's Party (PPP), had to form a coalition with him. Mr Sharif had one condition: reinstate the judges. Of course President Musharraf is against this. He fears a reconstituted Supreme Court would rule his election and/or state of emergency unconstitutional. It's believed Mr Sharif is counting on the restored judges to do so. He's said Mr Musharraf should be impeached. The president has been weakened, but he's not ready to go just yet. According to reports he's prepared to give up certain of his powers if the authority of the chief justice is also clipped. 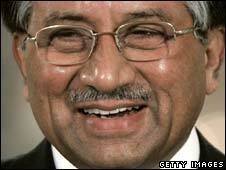 Political sources say Mr Musharraf's strongest backers - the Americans and the army - think that's a fair trade. Certainly, the Pakistan People's Party doesn't want any more political turmoil. "We need to be sure that we don't plunge Pakistan into another constitutional crisis that will lead to further instability and chaos," says Information Minister Sherry Rehman. "We are going to see to it that we pursue the policies of moderation and a peaceful transition." But many believe there's more to it than that. A peaceful transition from military to civilian rule was part of a Western-backed plan that brought the PPP's late leader Benazir Bhutto back from exile last year. Under the terms of the deal, the then General Musharraf was to grant senior PPP leaders amnesty from corruption charges, step down as army chief and allow the party to contest relatively free and fair elections. In exchange, Ms Bhutto agreed to support him as a civilian president. Since President Musharraf delivered his side of the bargain, there is pressure on Ms Bhutto's widower, Asif Zardari, to deliver hers, says political analyst Rasul Baksh Rais. "I think there's been an understanding between Pervez Musharraf and Asif Zardari on the one hand, and on the other, between Mr Zardari and Nawaz Sharif," he says. "The understanding between the latter is that the judges would be restored, and the understanding between the former is that Mr Musharraf would continue as president, but there is a complex contradiction between the two." There is personal animus too. 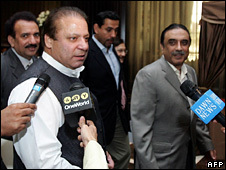 In an interview with the BBC Mr Zardari has accused Iftikhar Chaudhry of complicity in a campaign to victimise him while imprisoned on what he says were trumped up murder and corruption charges in the 1990s and early part of this decade. He's also said he remains committed to his pledge to reinstate the judges. But how to do so without either breaking up the coalition or challenging the president? For lawyers and civil activists the issue is simple: President Musharraf has acted illegally and unconstitutionally, and must suffer the consequences. The chief justice took a principled stand and must be restored. In the corridors of power, however, there are tortuous negotiations to try and square the circle, to reach a compromise that's "acceptable to all the stakeholders", according to one senior PPP source. A difficult task indeed, in a country where many of the stakeholders are unacceptable to each other.